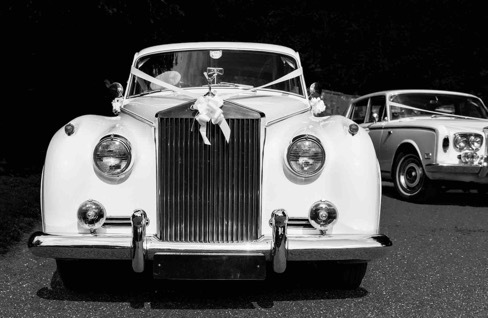 Luxury in Motion offers a premium, 4x4 chauffeur-driven wedding car hire service. We provide professional chauffeurs on your wedding day and have a wide range of 4x4 luxury vehicles available for wedding car hire. We primarily serve Surrey, London and the following counties: Berkshire, Hampshire, Sussex and Buckinghamshire. Our fleet includes the most prestigious 4-Wheel Drive car marques including Range Rover and Land Rover models. We can also supply a fleet of matching 4x4 vehicles, vehicles for your evening guest transportation, or honeymoon airport transfers. To reflect the nature of the wedding market, we offer discounts for wedding car hire on weekdays, or during the winter months and can also organise transport home for your evening wedding guests, or airport transfers for your honeymoon. Our chauffeur-driven 4x4 Land Rover Discovery Sport HSE is a perfect support vehicle to transport family members, Bridesmaids, or the Groom's party. For weddings it can carry up to 6 passengers as the vehicle features two additional fold-up seats in the boot area suitable for children. This can often mean avoiding the cost of booking a further vehicle. We can also supply child booster seats should you need them. Our 4x4 chauffeur-driven wedding car service is available across the South Easy in Surrey, Berkshire, West Sussex, Buckinghamshire and central London. We provide chauffeur services for weddings, to large corporate firms, corporate events, executives, all major airports and transportation hubs in the south east - including; St Pancras International, London Heathrow, Gatwick, Stansted, Luton, London City and Farnborough airports.